The 49-year-old is an archetypal conservative Republican lawyer. A member of the Federalist Society, he clerked for Supreme Court Justice Antonin Scalia. 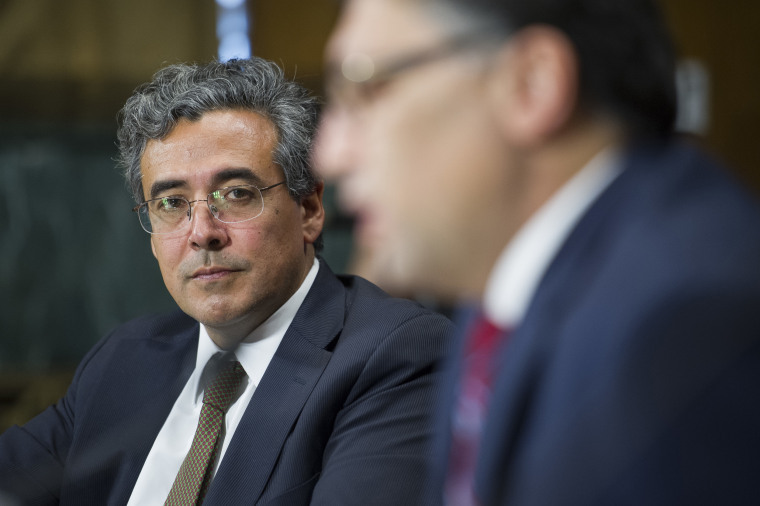 If Deputy Attorney General Rod Rosenstein is fired or quits, the Justice Department official overseeing the Russia investigation would be the solicitor general, Noel Francisco, who is actually fourth on the succession list. But it falls to him because the No. 3 spot at Justice is staffed with a person in an "acting" capacity, who would be skipped in the line of succession. It has not been permanently filled since Associate Attorney General Rachel Brand resigned in February. Attorney General Jeff Sessions remains recused from the Russia matter. That means Francisco would supervise special counsel Robert Mueller — discussing budgets, approving indictments and deciding whether Mueller can venture into new territory. And Francisco would be the person who would have to make the decision on whether to fire Mueller, according to Justice Department regulations, if there were cause to do so. Francisco, 49, is an archetypal conservative Republican lawyer. A member of the Federalist Society, he clerked for Supreme Court Justice Antonin Scalia and worked in the Justice Department during the George W. Bush administration. He also worked on Bush's behalf during the Florida recount that helped decide the 2000 presidential election. He has never, however, overseen a criminal investigation, and those who know him say he has no appetite for doing so. The solicitor general argues on the government's behalf before the Supreme Court, dwelling in the world of high-minded legal arguments, not subpoenas, wiretaps and grand jury testimony. His past writings and statements suggest that Francisco has a broad view of presidential power. "The president's constitutional responsibility to faithfully execute the laws requires adequate authority to remove subordinate officers," he argued before the Supreme Court in February. "The framers understood the close connection between the president's ability to discharge his responsibilities as head of the executive branch and his control over its personnel…The president's ability to execute the law is thus inextricably linked to his authority to hold his subordinates accountable for their conduct." Justice Department regulations say special counsels can be fired only for cause. But some people have argued that those regulations conflict with the president's absolute authority over anyone in the executive branch. Francisco may be best known for representing former Virginia ­Gov. Robert F. McDonnell in 2016 when the Supreme Court unanimously overturned McDonnell's conviction on corruption charges. Francisco served from 2001 to 2003 as associate counsel to the president, and from 2003 to 2005 as deputy assistant attorney general in the Office of Legal Counsel.